He tells me the sign that only I knew about, this was a secret, not one person knew about this, yes, and he reveals to me a sign: "the 17th of Tammuz". It happened what happened, oy, oy, Master of the Universe, Master of the Universe..In any case, the point of the matter is that we need to reveal and publicize and to give ourselves over for this matter - that the entire redemption depends on Rabbainu, Reb Nachman of Breslov, to learn his books, this is every os (letter), every lesson, every word of his is such a light that he is speaking to you, speaking about what you need, all matters that pass over you, that have passed over you, that are passing over you now, and also about this person, and that person, and each and every one, and also me, each and every one, and every word that Rabbainu revealed is an all-encompassing generality of each member of Israel, what is passing over him, and what has already passed over him, his sicknesses and the healings, not just the sicknesses! He repairs, purifies and heals all the sick, all the worst ones in the world that don't have any recovery! They don't have! No tzaddik can help them, but Rabbainu, Reb Nachman said, "And I heal her". This is the end of the story of the Seven Beggars. You know about the Stories, "Sipurei Maasiyos" of Rabbainu? Yes? At the end of the story of the Seven Beggars, at the end of this story, the 6th Beggar said, the 6th Beggar told a story and said that the Princess was hit by all of the bullets with all of the poisons, yes, and she fell and became weak, "And I..." So says the Beggar, "And I heal her..." This is said on all of the people of Israel, on each and every one, "And I heal her..." She had already fallen, she took all of the bullets and fell, "And I heal her", only *I* heal her, there *is* no one who can cure this, so Rabbainu hakadosh, so the Beggar said, "And I heal her", so Rabbainu hakadosh revealed about himself that he is this Beggar who heals her, "I heal her". He said on himself, "I...", yes. We are fortunate, we already have all the rectifications, the healings and the salvations that we need, each and every one of us through Rabbainu, Reb Nachman. Only Rabbainu, Reb Nachman - he is the root of the Torah, he is the root of faith, he is the root of every member of Israel, however he is, whatever place he has fallen to, whatever place he finds himself - He takes her out, he heals her! Yes, it's really impossible to heal such a sick person. Such a sick person doesn't have, there is no cure for such a sickness. But Rabbainu, Reb Nachman, revealed that he, yes, can heal and fix everything! Yes, there are in this wondrous matters, very hidden, but it has not been revealed in the world. I remember 70 years ago, when I drew close to Rabbainu it was forbidden to learn the books of Breslov, there was a prohibition against learning the books of Breslov! I found a Breslov book but I didn't know that it was Breslov. And I started to read it, then "What are you doing? You are learning this book?" This was the first time that I heard there was Breslov in the world. I didn't know there was Breslov in the world. Now I knew there was. "You don't know that this is from the books of Breslov? It's forbidden to read it!" Baruch Hashem, today we can read [them] in every shul, yes, anyone who wants to learn. These are signs of the redemption, signs that we are standing, that we are.. According to our level of knowledge, according to our deeds, we are already, already there isn't any rectification for sick people like these, but Rabbainu, Reb Nachman, was already in the world and he is the one who can fix all of the sicknesses and all..there is no place that he can't fix and heal, yes. So when we hear this, then we need to give ourselves over to put into our hearts his holy words, his lessons and the prayers and the halachos. There is a book, the books "Lekutei Halachos", do you know about it? We need to be experts in the book Lekutei Moharan. Rabbainu hakadosh said that we need to be experts in it that we can say it by heart forwards and backwards, even backwards, so much expertise is needed in this, because this is all our vitality, each word is all our vitality, every word of his, even one word. And Rabbainu hakadosh revealed that he is hinted to in the verse, there is a verse in Tanach - "A flowing stream, source of wisdom", the first letters of which spell "Nachman". He is hinted to in this verse "A flowing stream, source of wisdom", he flows and flows and flows, "source of wisdom". There was never any wisdom like this, there still hasn't been in the world. We have the Torah and all the books of all the tzaddikim and this [Reb Nachman] is the root of all the Torah, this rises above everything! Through this we can draw close to the Torah, to know how to see the light of the Torah. In the Torah there are many powers, there is an elixir of life and the opposite, yes. And through Rabbainu hakadosh we merit to see the light of the Torah as we need to. There are in this very hidden matters, but now we are seeing that all the world even gentiles, the wise men of the nations, in the university, they are very excited about Rabbainu, Reb Nachman of Breslov, even gentiles! I have spoken with some people from London who know about this. They are always speaking about Reb Nachman of Breslov, about the Stories, about his words, yes. And we see that the world are drawing themselves to Rabbainu, Reb Nachman of Breslov! We see that there were many tzaddikim in the world - the Baal Shem Tov and his students, there were many tzaddikim. [But] They are not speaking about [them]..they always only speak about Reb Nachman of Breslov, about the Stories, about his words, yes. It's as if we only have one left in the world, Reb Nachman of Breslov. Therefore, we, the main thing to take away from this is that we need to give ourselves over to be experts in his holy words, then we will merit, but [only] with faith, we can learn and be blind, we see nothing, if it's for arrogance, I am Breslov only for arrogance that we will be experts in Lekutei Moharan?! This is the main thing - to learn so that we will know how to wage war, strategies of war, how to battle and be victorious, to subdue the evil, yes. 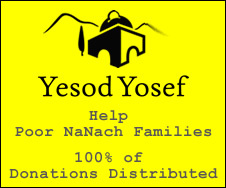 Nu, may Hashem have compassion on us and we need great compassion.